Google has exclusively revealed to TechRadar that it is launching Google+ Local – a new way to discover what's happening in your surrounding area through the search giant's social network. Teaming up with review and recommendation site Zagat, Google+ Local offers up reviews of restaurants, museums and the like within your vicinity, complete with a scoring guide and user-generated reviews. Given that Zagat has been baked into Google+, Local will also make use of recommendations from people in your Circles – adding their views to the Local section of Google+. With this new section of Google+ (which will get its own Local tab), Google is essentially cutting out the middle man and placing its service in direct competition with the likes of Yelp, Urban Spoon, TopTable and even taking on a significant chunk of TripAdvisor. Zagat also has an app on Google Play, so it will be interesting to see how it will fare now it has been integrated into Google+. Speaking about the new service, Bernardo Hernandez, director of product management at Google, said: "Today, we're announcing Google+ Local, a simple way to discover and share great local places like restaurants with Zagat scores and the recommendations of people you trust in Google+. "This is part our ongoing effort to provide a beautiful, consistent experience across Google that helps people turn their intentions quickly into actions." 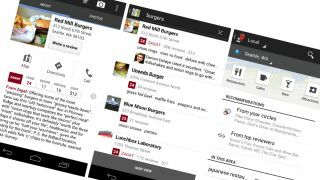 The Zagat recommendation system – which will replace the current 5-star scale with a 30-point scale – won't just be used in Google+ but will also be rolled out to a number of Google offerings, including Google Maps and will be also added to the mobile version of Google+. From a business point of view, Google will be opening up Google+ that little bit more, so that they can verify local Google+ pages for their business, make edits directly to the page and take advantage of things like Circle and Hangouts on the social network. All of this is coming soon, as is the ability to combine existing Google+ pages with new local Google+ pages. Google+ Local is being rolled out globally and in 60+ languages.